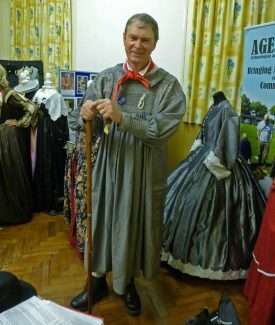 In 2015, AGES Archaeological & Historical Association (meeting monthly in Hadleigh United Reformed Church) obtained a grant from the Heritage Lottery Fund towards “Bringing Archaeology to the Community”. One aspect of that project was to develop historical costumes based upon local archaeological finds: one notable metal detecting find was a Tudor crotal bell found on the Salvation Army fields. 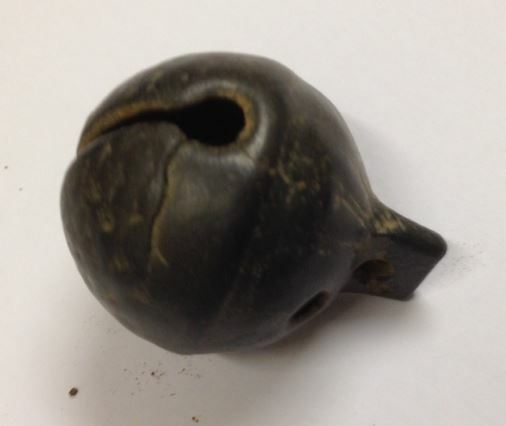 Such a bell could have been part of a horse harness. But when as small as this, it could well have been worn by a sheep, presumably for the most part grazing on the marshes below the castle. It is possible that the sheep in those early days would have been Romney Marsh sheep; bred over hundreds of years to be hardy in such conditions, able to feed in wet situations and considered more resistant to foot rot and internal parasites than any other breed. This inspired a search through Victorian records to identify any local shepherd and in the 1861 census, there was only one recorded: John Shillaker who was living with his wife and family “on Common” in Hadleigh. By that time, the local sheep may have been Southdowns such as those reported in the Chelmsford Chronicle as being on Claydon’s Farm in nearby Daws Heath in 1840. Southdowns had been developed in the 18th century on the South Downs into a fast growing breed producing lambs suitable for the growing London market, accessible by boat from the docks then in use down on the Hadleigh marshes. By tracking back, we found that John was born in Horninghold, Leicestershire in about 1799 and on Christmas Day 1834 in Stockerstonon, married Elizabeth, who was a similar age. (Elizabeth had previously married John Tookey in 1822, and had 4 sons, Christopher, Joseph, John and William Tookey between 1823 and 1831, but was widowed in her early 20s in 1832). Their son, Richard, was born in 1837 in Oakham, Leicestershire and another son, George, in about 1839. In 1841, they were still living in Horninghold with John as an “agricultural labourer”, so at the age of 40, not yet listed as a specialist shepherd. The family (including the 3 younger Tookey boys) moved for unknown reasons to Essex at some time between 1841 and 1843. Their daughter, Mary Jane, was baptised in Barling in 1843 with her father recorded as “shepherd”. By 1851, the family were living in Hadleigh with John listed as a “market gardener”. (The Tookey boys had grown up and moved on). In early 1861, son George married Eliza Lucking of Leigh, with John noted as a “labourer”. (The St James burial register of 22 March 1863 records the burial of Eliza “Shillacre” of Benfleet aged only 20. I fear that this is George’s young wife. It appears even worse when we read that in the same register on 6th August in the same year, there was the burial of Elizabeth Eliza Lucking Shillaker aged just 5 months). It is only in 1861 that John, then aged 62, was listed in a national census as a “shepherd”. So, in this way, John, by 1861, had become Hadleigh’s only listed “shepherd”. John’s daughter, Mary, was married in St James-the-Less in 1863 to a local labourer, George Barber Russell, with her father then recorded as “farmer”. John died in 1864. His widow, Elizabeth, died in 1870. (Both are listed in the burial register of St James). 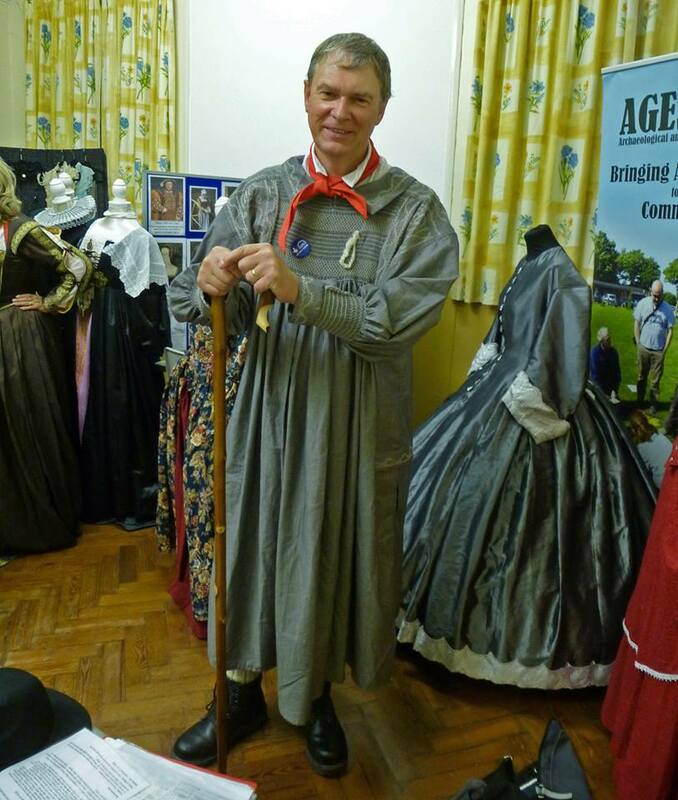 So, in early 2015, AGES AHA members progress to trying to learn how to make an authentic shepherd’s smock and obtain a crook made from local wood so that we can add them to our costume wardrobe to help tell the story of the lives of Hadleigh’s shepherds at future local fairs. If anyone wants to help in these activities, come and join us at AGES AHA. Click here for more information on AGES AHA. I can tell you a bit more about John and his wife. Elizabeth (already a widow in her early 20s) had married John Tookey (an agricultural labourer) in Stockerston Leicestershire in 1822, and had 4 sons, Christopher, Joseph, John and William Tookey between 1823 and 1831. She was then widowed again in 1832 and married John Shillaker in Stockerstonon Christmas Day 1834. Elizabeth and John moved to Barling around 1842, taking the 3 younger Tookey boys, as well as their own two sons, just before their daughter Mary Jane was born. By 1851 John and Elizabeth and their 3 younger children had moved to Hadleigh, and John’s occupation was a market gardener. The 3 Tookey boys stayed in and around Benfleet, and many descendants remain in the area.